Down below is the description of the development process I undertook for my User Experience studies and certificate. While discussing with friends and colleagues about other language programs, it became evident that these applications, although extremely well designed, didn’t take in consideration the necessities of a student to truly understand the intricacies that learning a language entails, while favoring an assimilation by repetition combined with intuition approach. A more detailed survey and qualitative research clearly pointed out that all participants who had given these applications a try dropped out from the major language learning labels in a matter of weeks, pointing out the inadequacies of their teaching methods. 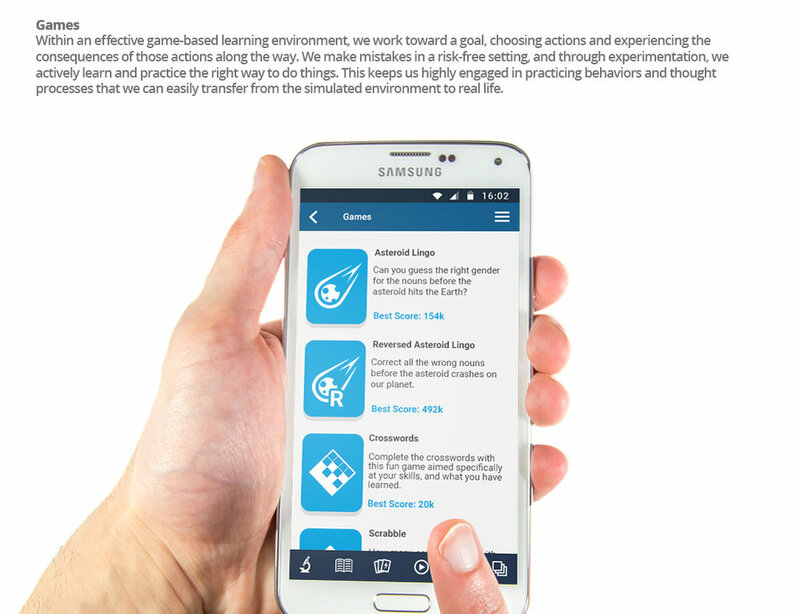 As the number of unsatisfied users grew, relating to the same issues and shortcomings time and time again, the project started taking shape to lay down the foundations of a more extensive application purposely designed for those who are not contented with just a specific learning method, or cannot be bothered to switch from one program to the next to meet their ideal training quota. The DIY or Do-It-Yourself approach was tailored enable the willing students to truly understanding a language, the grammatical idiosyncracies and peculiarites, giving them the freedom to choose the learning method they prefer. 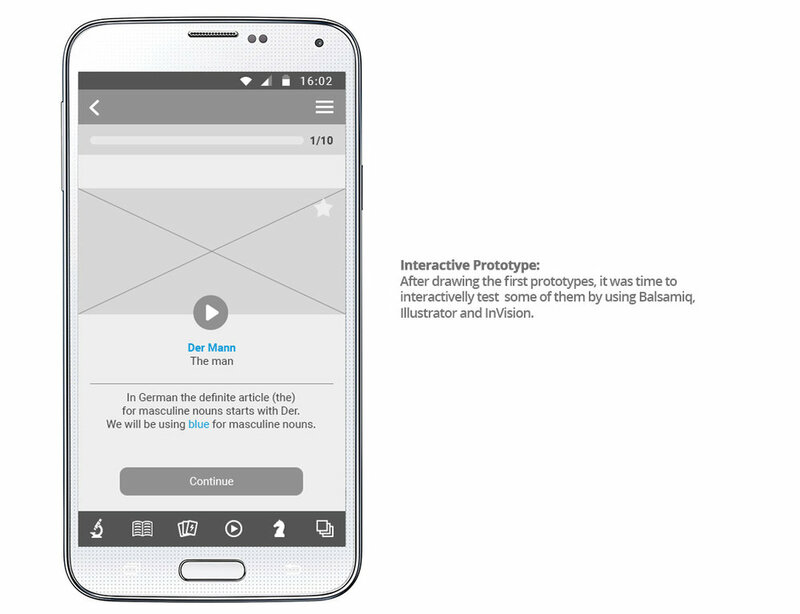 Interactive and User Experience Design are wonderful concepts and tools to make our daily busy life easier, or just distract us from a tiny little while from our chores. 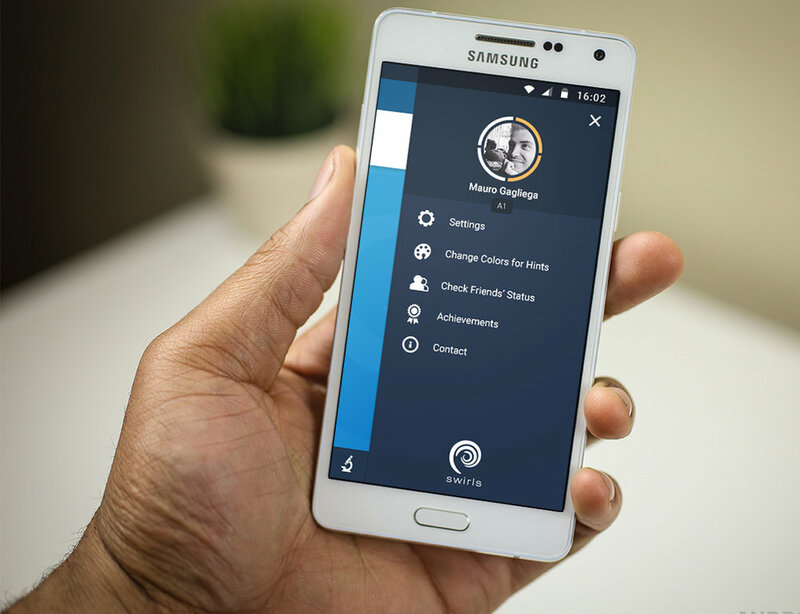 With the advent of smart phone connectivity, we have become increasingly good at reducing not only the content depending on the real estate of the device being used, but also the distribution of the knowledge that can be imparted. As the years have progressed, we have found ourselves living with tiny portions of information that, instead of making our life easier and speed up our learning, they might become burdensome and gimmicky. This is where Swirls came about. Learning a language, especially the more complex ones, is a daunting task that is often underestimated, and by quantitative and qualitative research, I managed to confirm this hypothesis for poor retention and dropping rate in the usage of the most notorious language learning application on the market. The teaching is just not appropriate for the massive bulk of information we need to learn. Swirls combines a focused Guided Path learning program with DIY method. 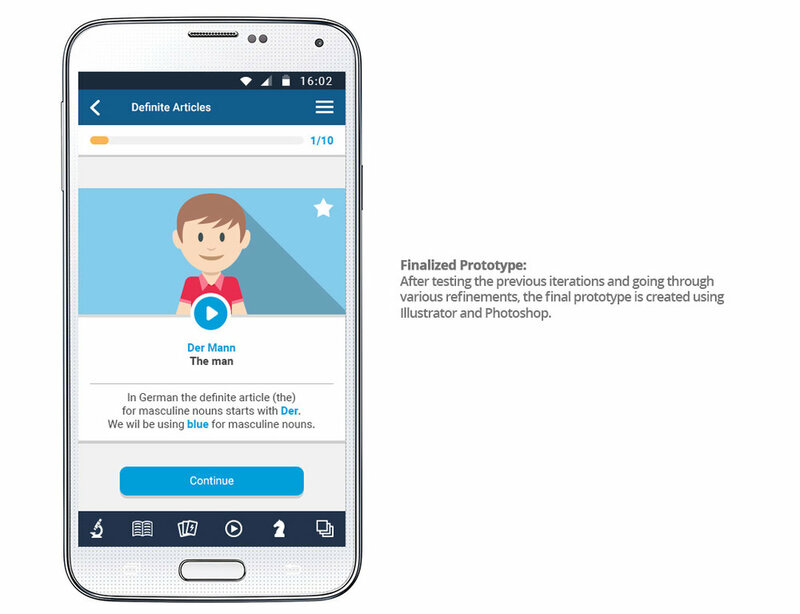 DIY allows the user to choose his own learning method instead of being forced into one. 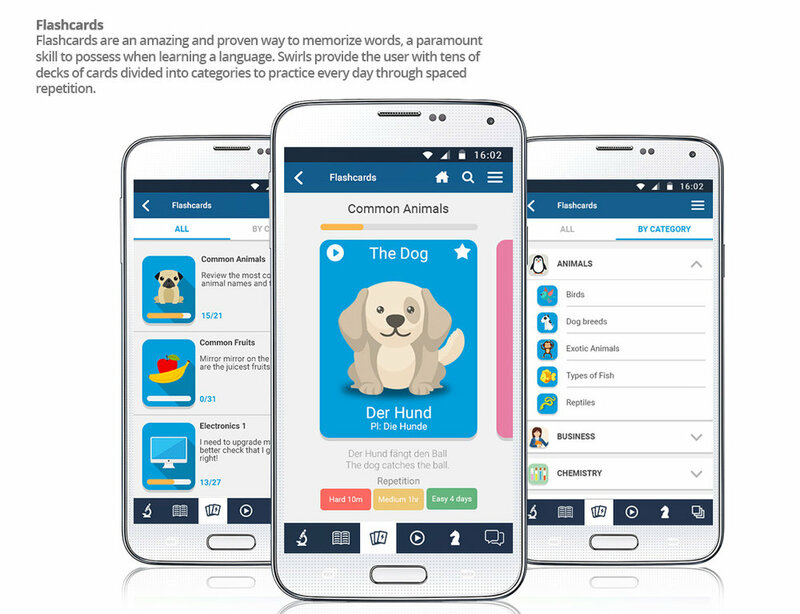 It combines memorization, listening, reading, writing and playing into one application. It focuses its attention on quality instead of quantity, focusing on the 5 most spoken languages in the world. The qualitative research was conducted by remotely interviewing 7 people of different nationalities and backgrounds, and extending the inquiry to over 29 individuals across the world through the SurveyMonkey’s poll system, for a total of 36 surveyed. The sampling took notice of ages, nationalities and especially problems the users had with previous language learning applications, in order to identify their needs and improve upon their past experiences. Most of the answers received regarding the first question spoke highly of the interface of applications such as Duolingo and Babbel, easy to follow and to the point, which prompted me to further investigate on their user interface and learn from them.The main complaint about the cited programs was the lack of depth, how shallow the teaching was presented to the user, and how most things taught couldn’t prepare you for a real-life conversation with a native speaker. Further analysis led to the disclosure of correlative behavior across the board while using language learning applications, thus leading to the creation of a Customer Journey Map indicative of their experience. The information about retention and drop rates are sporadic and scarce at best, with data harking back to the first years of their inception. The retention rates dwindle at around 26% by the 10th week of using the application, and the drop rate as high as over 60% by the same time. All applications seem to entice a big portion of the users for as little as a few hours to a few weeks before dropping out and possibly coming back to learning with said system after a long hiatus.Market research analysts predict the education apps market in the US to grow at a CAGR of approximately 31% during the forecast period. The rising penetration of e-learning and m-learning in educational institutions is expected to result in the extensive digitization of educational methodologies. This extensive digitization of educational methodologies is anticipated to bolster growth in the education apps market during the forecast period.The growing demand for e-learning is the key driver for the growth of this market. The rising adoption of gadgets, such as tablets and laptops, by students, is expected to pave the way for digital textbooks and other online educational content. Since e-learning facilitates customized learning for students by preventing the generalization of educational content; their augmented adoption is envisaged to result in market growth during the forecast period. In this market study, analysts have estimated the primary and secondary education segment to be the largest market segment during the forecast period. Much of this segment’s growth can be attributed to factors like the growing preference for blended learning and the rapid growth of the virtual schools in the US region. After collecting all the data, a representation of the typical users based off the user research was necessary, incorporating the goals, needs and interests. 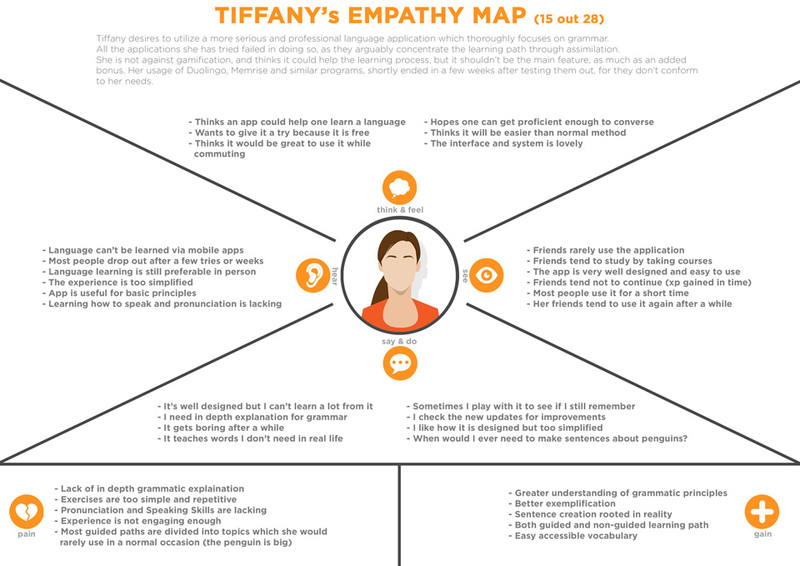 By combining various responses, these fictitious personas and correlating empathy maps were created to streamline the prototyping process that will come ahead. 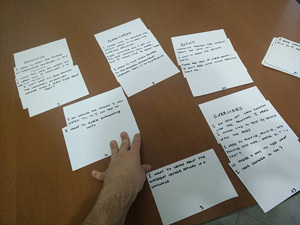 The card sort process was run in multiple ways: online via Optimalworkshop.com, to access a wider demographic and cultural differences, remotely on Skype and in person to have a better and clearer understanding of the decisions taken while listening to their reasoning for categorization through personal interaction. I found the combination of these card sort methods to be highly illuminating to highlight the initial flaws of the design, and simplify the user flow for the next step, prototyping. 10 anonymous people participated on the online card sort, 5 users via Skype were selected who best represented the identified personas (see: Personas for Swirls) and 3 in person. Being a very vast and pedagogical project, I ran a close-card sorting with pre-determined categories such as: “Grammar”, “Flashcards”, “Videos”, “Exercises”, “Settings” and more, and simplified the jargon in the question making to avoid confusing the participants who might have been unfamiliar with terms such as the accusative case and declinations. The results showed that most users had very few problems in placing the cards in the right category, such as for “Settings”, “Grammar”, “Games” and “Videos”. By analysing the result matrix, it became apparent that there was an overabundance of categories that were perceived as highly similar to others, such as “Refine List”, “Hints” and “Search Bar”. 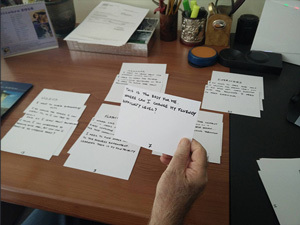 During the card sorting process, I asked to vocally illustrate the reasoning behind their picks, which revealed a tendency to learn some grammatical concepts through exercising, the way Duolingo and other language applications do, while others expressed confusion in the role the Flashcards possess, having never used them themselves. The biggest issue, which corrisponded with with Optimalworkshop’s placemens matrix was an insecurity in the refining of the search results, which they described as “superfluous”. Keeping this in mind, I created a sitemap which should pave the way to a more user-friendly and interactive usability. It takes a lot of will power and dedication to learn a language you are interested in, nothing comes easy, and mastering how to fluently speak may require years of training. Making the assumption that the average user has the intention to pursuit this endevor, and taking in consideration the quantitative and qualitative research presented above, the customers may feel frustrated to be forced in one single guided path, opting to choose the way they want to learn by themselves, review concepts, rules and exceptions may need to be read and studied over and over again to be fully comprehended, and a few hint pages might not stick. The people surveyed expressed great frustration in going through more advanced lessons without being taught what they were trying to learn in the first place. There needed to be a way to help students achieve their goal and meet their desires, and the answer is just providing them with the tools necessary to choose for themselves how to approach the subject, while reminding them of their progress, successes and training exercises meant to leave a mark in the long-term memory. Creating an application without a guided path, at the same time, might feel too overwhelming at first glance, and push away possible users from even trying.